Are you going to show off your marksmanship at an upcoming competition, or just curious to see exactly how well you can shoot on your own terms? 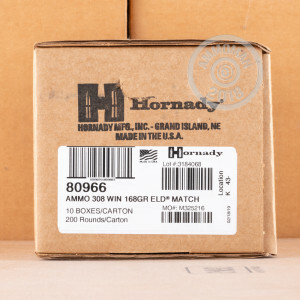 In either event, Hornady delivers just what you need to excel in the form of this 308 Win cartridge from their Match line of ammunition. 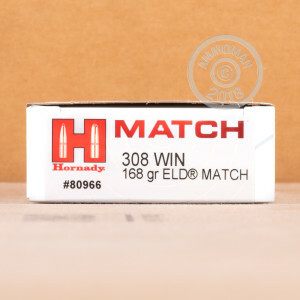 This round features a 168 grain ELD Match projectile. Its name stands for “Extremely Low Drag,” a feat it accomplishes completely with its aerodynamic secant ogive profile as well as its ballistically efficient boat tail design. The ELD Match’s flat trajectory, heightened immunity to wind drift, and greater downrange velocity all lend themselves to thoroughly accurate shooting. This bullet further offers a nearly perfectly concentric AMP jacket, swaged lead core, and Heat Shield tip which will not deform when confronted with aerodynamic heating. 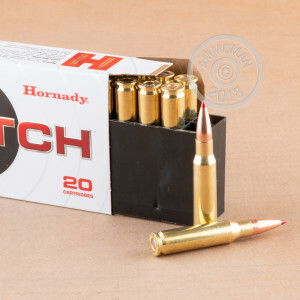 Hornady has engaged their characteristic commitment to pervasive quality control throughout this cartridge. Its select brass casing, carefully matched propellant, and sure-fire primer all come together nicely in order to provide the support that its perfectly seated tack driving projectile needs in order to shine.